For the last two years, I’ve been composing every month a satirical epic poem on the administration of the forty-fifth president of the United States—styled in ottava rima, the verse-form of Lord Byron’s Don Juan. 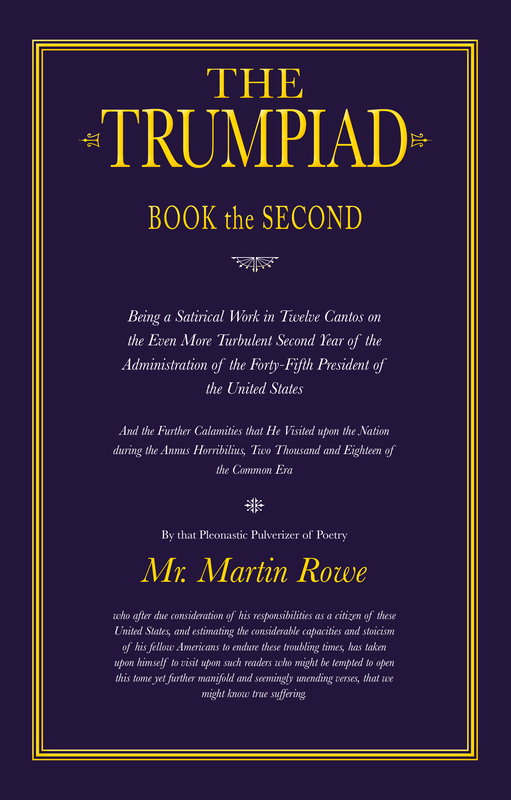 Although I’m dismayed that the current administration has lasted as long as it has, I’m nonetheless delighted to announce that my poetic effusions on the reprobate’s second year in office is now available—as a printed work, an ebook, and an audiobook (read by yours truly). As with the first volume, Book the First (also available as a printed work, an ebook, and an audiobook—also read by yours truly), all proceeds after costs will be split between Vine, a farmed animal sanctuary in Vermont, and New Alternatives NYC, a group that helps homeless transgender youth in New York City. I hope you’ll support these groups, even if you don’t wish to purchase either or both volumes of The Trumpiad. If you don’t want to support their work or buy the volumes, you can read Book the First on this page, and Book the Second on this. The ongoing Book the Third continues here. This entry was posted in The Trumpiad, Verse & Lyrics. Bookmark the permalink.